Amy Espeseth chats with Deborah Robertson about her debut novel, Sufficient Grace, a haunting tale of faith and violence in a closed-off, deeply religious world. From the moment the terrorist attacks on New York’s World Trade Center set the climate for the new century, the West has been analysing Islamic fundamentalism. But what do we really know of fundamentalist Christian faiths? How well do we understand their moral orders, and their dictates on the hearts and minds of followers? 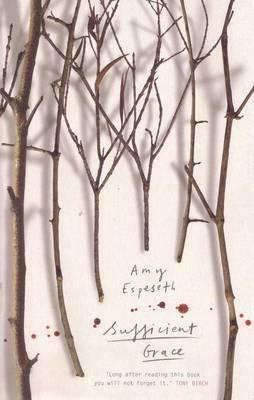 In her entrancing debut novel, Sufficient Grace, winner of the 2009 Victorian Premier’s Literary Award for an unpublished manuscript, Amy Espeseth takes us into a community of Pentecostal fundamentalists and tells a mighty tale of sin and retribution, intimately examining the lives of people whose religion is a warm yet claustrophobic embrace. Sufficient Grace is not a novel built from research or flights of fancy, but one that is deeply embedded in its author’s own experience. Of Norwegian descent, Amy Espeseth was born into a fundamentalist Pentecostal family in Barron, Wisconsin, in 1974. She has lived in Australia for the past 16 years, but given her novel’s keen sense of authenticity and rootedness, it was inevitable when we met that I ask her about autobiographical influences. Ruth’s life is one of marked dualities. Her world is divided into light and dark, good and evil, order and chaos, sin and absolution; it is this great tension between absolutes that both powers the drama of the novel and offers readers a visceral experience of felt life within such a faith. Within her small extended family, Ruth is also anguished by a frightening secret. This may go against her faith, ‘but now and then a body needs to keep its own secret space, maybe running down the middle of the soul like a candlewick’. While Ruth’s knowledge grows in darkness, threatening to break her world apart, she has the natural world to escape to – a strength that also runs through her soul – and one that provides the novel with its slow-pulsing beauty. Sufficient Grace is a story of snow and ice, coyote and deer, the peeling black and white bark of birch trees, the bleeding sap that feeds the tiny ant. Ruth’s view of nature is not a romantic one. Espeseth doesn’t write the natural world as a lyrical backdrop to human life: her two worlds are interdependent, not only in material ways – the seasons determining the movements of her characters, the satisfaction of needs – but in matters of the spirit too. Along with her clear-eyed rendering of the natural world, one of Espeseth’s distinctive talents as a writer is the musical quality of her prose, its rhythms sometimes driving and insistent, sometimes incantatory, often song-like. I ask her whether she thought her religious upbringing had influenced her prose style. There’s always something special about a first novel. No matter its subject or style, it’s always a time when a writer draws together the threads of the life they’ve lived, and speaks back to the powerful homogenising forces in society that would have us all look and think and feel alike. And a first novel such as this one, which generously opens a hidden world, a way of life, to our scrutiny, is a fascinating contribution to our understanding of the many different ways in which people strive to make meaning of their time on earth. The winner of this year’s CAL/Scribe Fiction Prize, Amy Espeseth’s second novel, Trouble Telling the Weather, is scheduled for publication next year. This is a first novel to celebrate; a gifted new writer is among us. Sufficient Grace is out now in paperback ($29.95) and ebook ($17.99). Deborah Robertson’s first book, Proudflesh, won the Steele Rudd Award, and her first novel, Careless, won the Colin Roderick Award and the Nita B. Kibble Award. Her latest novel is Sweet Old World.